Porcelain veneers, also known as porcelain laminates, are thin shells of porcelain that are custom made to fit over the front surfaces of the teeth. The veneers allow light through to create a natural appearance. The veneers completely mask unattractive stains. Veneers can be a permanent solution to cosmetic dental problems such as gaps, chips, excessively small or large teeth, and“antibiotic” stained teeth. Crooked teeth can be covered with veneers to straighten the look of the smile. Veneers are affixed with an adhesive to the front surfaces of the teeth. 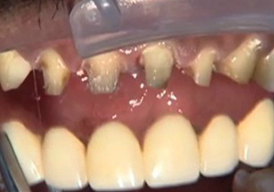 Patients can have their new smile designed in as little as 2 visits. 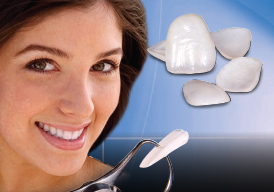 Porcelain veneers are extremely durable, and you will be able to eat almost anything. Your cosmetic dentist’s skill will determine how beautiful and natural your new teeth and smile will look. When making porcelain veneers, most cosmetic dentists allow the laboratory ceramist to determine critical aesthetic proportions such as tooth shape, angle, width, arch form and length of teeth in relation to the lips. Dr. de los Reyes determines all of these critical aesthetic factors by creating a mock up on the patient’s own teeth directly or indirectly by sending the mold to the laboratory. 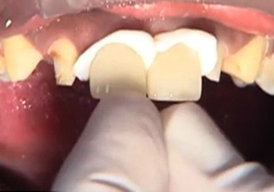 This process allows the patient to “preview” the final result. A resin copy of the prototype is then used as a temporary veneer, which further allows the patient to evaluate the aesthetics of the new smile at home, and live with it on a trial basis. Finally, the lab receives a model of the prototype and then reproduces the defined aesthetic proportions for the new veneers. This process eliminates any guesswork on the ceramist’s part.